In less than a year and a half over $312,000 in committed funds have been pledged towards the project. $266,000 of the $312,000 has been collected so far and is “cash in the bank”. Committed funds have come from individuals, businesses, special events, and grants. What’s amazing is that 44% or $137,000 of donations have come from New Haven High School alumni. This in itself demonstrates the love that past graduates have for their school. Pictured is Brad Zobrist speaking. Zobrist also added that the committee has applied for several grants that they feel confident they will receive. Additional grant funds could potentially add $27,000 to the committed funds total, bringing the total grant dollar category to $57,000. He did note these funds are not guaranteed. 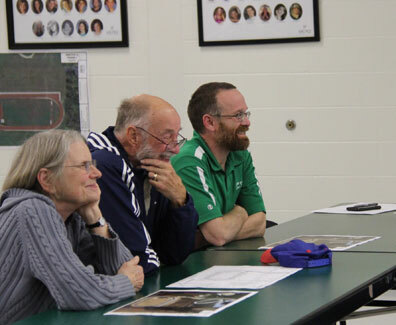 Zobrist also said that once the project begins and we have demonstrated our commitment to build is when we will likely see more grant opportunities. 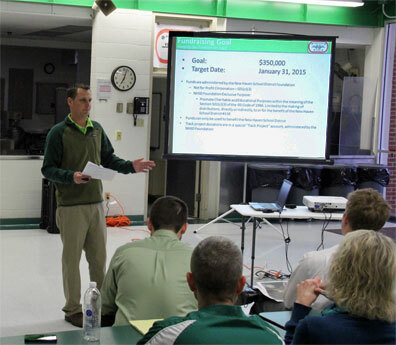 Pictured is John Nilges addressing those at Tuesday’s town hall meeting. 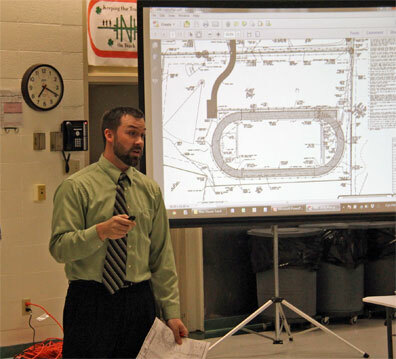 New Haven graduate, John Nilges with BFA Engineering Surveying, provided information on what his company has been working on and what the next steps they will begin taking to start the construction of the track. Nilges said they will begin sending out request for bids to contractors around the beginning of spring. Nilges emphasized that the most important first step is the infrastructure and making sure they have a solid base and proper drainage. “Before we begin pouring asphalt and concrete there has to be a solid foundation. The last thing we want is to begin laying the surface and several years later for it to start cracking due to pour dirt. Basically, we want to do it the right way the first time to prevent any issues in the future that could end up being costly to redo.”, said Nilges. Nilges did explain, while he is very confident that construction will be underway by late summer, the only thing that could effect this is if a contractor would comeback with a “discounted” bid if they could hold off until around the fall. Generally there are situations where other schools are wanting a track down right away, a contractor could ask for an extension just to insure they have work during the later part of the year, in which Nilges said at that point we could say that we would need a “discounted” quote. Pictured: New Haven Track Coach Johh Tucker. Regardless, the New Haven Community Track Project has now become a reality and will soon have a brand new track. Following the meeting we briefly spoke with Track Coach John Tucker, who’s dream has always been for New Haven High School to some day have a track. 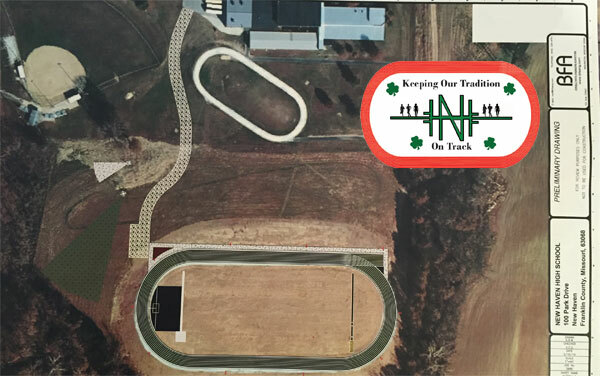 Click here to learn more about how you can make a donation to the New Haven Community Track Project. 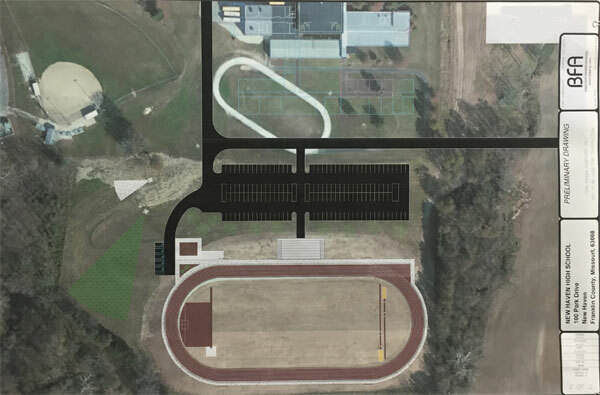 Pictured is a preliminary drawing of what a fully completed track complex could look like. It is important to note this is simply an example of what the finished project could look like years from now as funds become available.